In the current economic climate, the easiest thing to say about organic food is that it’s expensive; there’s no getting around it – organic food is universally more expensive than its non-organic equivalents. (And there are good reasons for that, which I’ll come to later). But that’s not all there is to say about organic by a long shot and properly understanding the benefits may persuade more of us to incorporate a little more organic produce into our weekly shops, even if we can’t afford to make our whole shop organic. ‘Organic. Naturally Different’ is an EU funded campaign to help consumers understand more about organic food so they can make informed choices when they shop. Usually, evangelists for Organic lose my support is when they insist that everything organic tastes far superior to non-organic versions or that it is more nutritious. The latter claim has been debunked by researchers at Stanford University, who found very little difference in nutritional content overall. On the first point, my experience simply doesn’t bear it out. Of course, if I compare (high welfare, non-intensive, carefully regulated) organic produce with the results of lowest end, intensive farming methods, I can taste the difference, yes! But if I buy high quality non-organic produce from farms with equally high welfare standards and non-intensive farming methods as their organic colleagues, I am simply unable to taste the difference. Happily, ‘Organic. Naturally Different’ is not trying to make either of the two tired arguments above. The first point is that organic is better for nature. Using fewer pesticides protects the environment and encourages wildlife. Insects, birds and animals thrive on organic farms, where farmers keep soil healthy by using crop rotation and natural feeds to make soil fertile. This in turn produces healthy crops with a natural resistance to pests and diseases. A (commercial) downside to this is more labour intensive farming and lower yields, both of which contribute to higher end costs for the consumer. Secondly, we are reminded that organic means higher welfare standards. You can buy free-range that isn’t organic but organic is always free-range. And feed and drug use are strictly regulated too. Again, specified feeds and fewer animals reared per acre of land means higher end costs for the consumer. Organic contains less pesticide residues. In the same study I link to above, the Stanford University researchers discovered that non-organic food contained approximately 30% less pesticide residues than organic (though do note that organic food is not 100% residue free). Organic is natural food. What the campaign means by this is that genetically modified crops are banned as are hydrogenated fats, artificial pesticides, aspartame and a variety of artificial colourings and flavourings. Lastly, they remind us that organic food tastes great. And that, I’m happy to agree with. Like all low-intensity, carefully farmed and reared produce, organic produce tastes like food should. Organic Food UK, who are organising the campaign, recently sent me a delivery of organic food and asked me to think about ideas to make these items go farther, with ideas to stretch whatever organic produce a consumer could afford to include in their shop. At Waitrose, Essentials range chickens cost £3.28 a kilo, free-range ones are £4.34 a kilo and Duchy organic chickens are £7.09 a kilo. At Tesco those prices are £2.48 a kilo for Value chickens, £4.50 a kilo for corn-fed free range chickens (currently on offer, usually £6) and £7 a kilo for organic chickens. Tesco (non-organic, non-free-range) chicken breast fillets are £11.43 a kilo and thigh fillets are £8 a kilo. Waitrose charge more for breast fillets which are £13.78 a kilo but less for thigh fillets at £6.99 a kilo. Buying a whole chicken (and jointing it into portions yourself or cooking it whole and stretching it for multiple meals) is still much cheaper than buying ready-portioned chicken meat and perhaps that saving is enough to let you choose organic now and again? 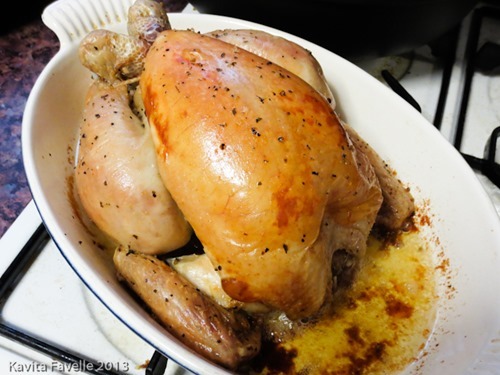 Most commonly, we roast them plain and simple with butter, occasionally adding lemon and herbs. Sometimes we poach a whole chicken in the slow cooker, in water with onions, carrots, leeks and a bay leaf thrown in, if we have them to hand. The second method has the added advantage of producing a delicious portion of stock during the cooking process. In both cases, we serve a reasonable portion for the first meal and then I carefully pick every last scrap of meat from the carcass, to be used in other recipes. In both cases, once the carcass is stripped of meat, the bones, soggy skin and cartilage go into the slow cooker with nothing but water, and cook overnight to produce more stock. (Yes, we put the carcass in to make stock even when we’ve poached the bird originally, and this still produces a second stock that is full of flavour). Oh and when we roast the bird, we always pour the fat from the roasting dish into a pot and use it to cook the roast potatoes for our next roast dinner. Delicious! Quality sausages really are miles better than the cheapest ones. It’s one of those products where spending more nearly always pays off in terms of what you get. Sausages work very well in hearty casseroles, such as the bangers and Boston baked beans below, or Pete’s beer and sausage casserole (which you can make look more attractive by skinning the sausages and forming into balls before cooking, if you prefer). Allowing the sausage meat to flavour other ingredients is a great way of feeding more people with a single pack. If you buy extra mature cheese, with a really good and strong flavour, you can use it to flavour dishes rather than as the main ingredient. Yes, they can be roasted, boiled, mashed and baked but they can also be so much more. Eggs are wildly undervalued as a budget ingredient, in my opinion and, like potatoes, there is so much more to them than different cooking techniques such as boiled, fried or poached. Once again, eggs are an ingredient where you do get what you pay for – the flavour of great eggs is just so fantastic. And of course, you can make home-made custard (and ice cream), home-made mayonnaise or Bearnaise sauce. I adore mushrooms! They feature frequently in our cooking, sometimes as secondary ingredients and sometimes as the stars of the show. They’re a great alternative to meat, because of their deeply savoury flavour. We make risotto all the time, usually with chicken stock we’ve made after enjoying a roast or poached chicken. Also in the delivery were flour, couscous, carrots, butter, milk, cream and fruit. Fruit was mostly eaten fresh, but when the last apples got a little wrinkly, we made a simple fruit crumble with them. Kavey Eats was sent a selection of organic produce by Organic UK Food. 15 Comments to "Incorporating Organic Into Your Weekly Shop"
Wonderful post with a lot of good info. I can’t say I go out of my way to buy organic. Instead I go by eye, I go out of my way to buy what looks best, And most of the time, it ends up being organic. That sounds like a good way to shop. I think many people have lost the confidence to trust their own senses when it comes to assessing and buying food. Smell, touch and appearance can tell us a lot about the quality of fresh produce. I’ve always tried to buy the cheapest eggs possible, and never been able to taste any difference. Watching an organic farmer explain how he was adding organic colourant to chicken feed to get the richer yolk colour cemented my opinion. This is fascinating and eye-opening! Thank you for sharing! It’s good to keep informed. So much info flying at us, it’s not always easy, see the link Snow provided above, but we can only try! loads of fab recipes, what a great post… my feeling is similar to yours plus I would always choose local over organic too… love the look of that chicken too! The first Thanksgiving after my cancer diagnosis, I was determined we have an organic Thanksgiving. My late brother used to enjoy a “whole turkey”. I shopped for our meal at Whole Foods (which is often referred to as “whole paycheck” over here, LOL) and was frankly rather surprised at how relatively little it cost, as it was actually about 50% of what I thought it would be. Now that my brother has passed away, I don’t eat much meat here at home, because it takes me forever to go through it, even with a good freezer in the house. But this time of year, when we’ve had a “kind” year weather-wise, I have enjoyed shopping at a road-side stand not far from my house. I was there on Friday, buying fresh corn, tomatoes, potatoes, cabbage, beets. I know how all of it was grown, and where it came from. I like that, and I think it’s better for me psychologically, so it must be better for me physically, too. The taste better argument really gets my goat. I’ve always been a keen advocate of organic, but that particular “fact” just isn’t true. I’ve had plenty of tasteless organic carrots in my time and lots of very tasty unorganic ones. I understood that the Stanford study about nutrition was flawed and that organic food is generally more nutritious. I expect that one will run and run. Choclette, I hadn’t come across anything claiming the Stanford studies were flawed, but I’ll look again. They did say that in dairy products, there were slightly higher in omega 3 and 6 but even this was not very significant amounts. I’m totally with you that some of the best tasting food I’ve had has been grown with love, care and high standards, but doesn’t happen to be organic. Hence why I’m happy for them to say “it tastes great” so long as they don’t try and suggest it tastes better than all non-organic alternatives! Great post Kavey. Like you, I am taking part in this campaign and currently wading through all the produce that has been sent. I am struggling at the moment to present a cohesive blog post as there are so many different factors popping into my head about the pros and cons of organic food but you’ve nailed things fairly succinctly. At the moment, all I can think about is how flatulent we were after eating all the onions but will try and give a crack at delivering my thoughts soon.